Most organizations today are focusing on enhancing customer engagement through innovative technological means. And for a good reason. Studies show that online customers prefer websites that come equipped with an embedded callback technology increasingly. These initiatives aid in an improved customer experience that leads to greater brand loyalty and brand retention. It enforces a connection with the customer that goes beyond the transactional level. Playing an integral role in reinforcing this connection is Click-to-Call. Without invading into the customer’s privacy, this technology allows them to interact with businesses in the most user-friendly, convenient, secure, and reliable way possible. 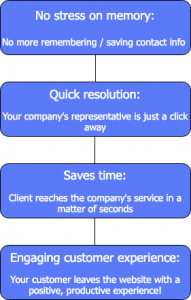 So, let’s deep dive to understand the basics of Click-to-Call technology and comprehend the whats, hows, and whys. As the name suggests, the Click-to-Call feature lets a potential customer get in touch with a company representative in real-time just by clicking the Contact Us or Call Now button they see on the company’s website/app. Alternatively, this type of digital communication also allows customers to receive a call from any company by simply dropping their number on the company website/app. Sometimes, customers only want to talk to a real person and this feature is especially useful for customer-facing teams across industries. We demonstrated what customers stand to gain using the Click-to-Call functionality, now let’s understand what kind of benefits business can leverage from this feature. Better lead quality & customer segmentation: For starters, businesses get the opportunity to speak to a “quality” lead as only people who are truly interested in their product/service will take the effort to click on the button. Additionally, it helps them to categorize customers based on their needs for specialized interaction. Zero leads missed and better customer experience: The customers have the option of reaching out to your business at any time of the day and dropping in a callback in case of non-working hours. This ensures that no leads are ignored/missed and every customer concern is addressed thereby providing a hassle-free customer experience. Time saved: This feature aids agents in reaching the customer instantly without the need to dial a number manually every single time. Impactful data analysis: Businesses can track and analyze the data extracted from the calls, thereby providing them deeper insights about their customers – after all, information is power in today’s day and age. So what you automatically get is a customer-base that’s accurate and future-proof. Prompt customer service & increased conversion rates: Having a Click-to-Call feature helps businesses catch their customer’s attention while their interest is still hot in their product/service. Providing prompt service helps convert customers while they’re still interested and also helps build a long-term customer relationship with the business. How to set up Click-to-Call? 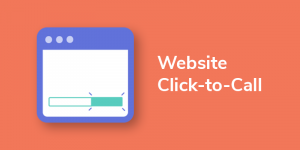 If you’re wondering how to add click-to-call on your website, it can be installed by integrating our Click to Call API on your website. The user then enters their number on the link/widget installed on their website. The company then instantly connects the call to the pre-assigned number. The agent and customer are now directly connected through the call. But what’s crucial is to ensure that the button is placed at appropriate “interaction points” so that businesses can convert visitors to potential customers. From a logical business point of view, the position of the Click-to-Call feature matters as much as having the feature on the platform in the first place. A clear call-to-action button where the customers are able to see it within 3 seconds also boosts the click-through rate. It’s no secret that more and more users are shifting to the “smartphone culture.” And around 47 per cent mobile users claim that they will shift to other brands if they are unable to find a brand’s contact number quickly. Keyword: quickly. In such a scenario, this feature comes in handy. 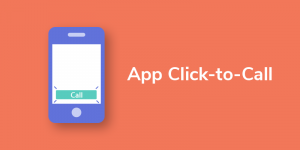 If you’re wondering “How do I create a call link”, you can do so by integrating Exotel’s Click to Call API in your app. Users can place voice calls on your app from their mobile phones without having to switch between apps to make the call. This helps users to be engaged within your app itself. So, if you’re looking to add a new dimension of smartphone marketing into the mix, Click-to-Call can be your best bet. Integrating your CRM with Click-to-Call services helps you to address customer needs accurately and promptly. Factors such as date of call, time of call, call volume, frequency of dropped calls, etc. will be recorded automatically thereby improving the productivity and reducing manual intervention. After all, no one wants to waste time and energy entering data manually. Basically, any data emerging out of incoming or outgoing calls will be stored in a central database helping you analyze the data intuitively. 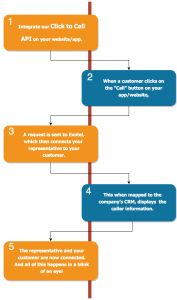 All this and more can be achieved by simply implementing the Click-to-Call feature into your existing CRM framework. We at Exotel, can help with the technical implementation so that you can enjoy the benefits of “Click-to-Call” technology. An emerging technology and important variation, the Click-to-Callback feature is also similar to click-to-call. The customers drop their contact number on the website/app and a company representative then gets in touch with them as per their availability. This allows for greater flexibility and optimized costs for businesses across any domain/industry. Typically, this feature is extremely helpful when the company is short-staffed. The digital world is dynamic and ever-evolving. And so are its customers. But when it comes to customers choosing their preferred mode of communication with businesses, telephonic communication wins all the way, especially for enterprises. So if you’re looking for innovative, result-oriented ways to reach out to your customer, features like Click-to-Call and Click-to-Callback are the way to go. A vital part of cloud telephony, these features offer three most important advantages that can impact any business’s potential in a measurable way: increased productivity, greater sales and profits, and enhanced time & resource management. Additionally, customers have the ability to reach businesses round-the-clock which work in their favour as they know their calls will never go unattended. 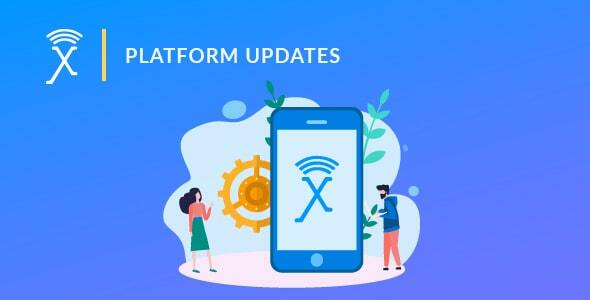 If for some reason, they are unable to get answers to their queries in a self-service manner on the business’ platform (website or app), they can simply click one button to get all the answers. This leads to a satisfied, happy customer who feels valued at all times. If you have any questions or wish to know more about how you can get on the Click-to-Call bandwagon, visit our website or leave us a message, and we will get in touch with you right away!